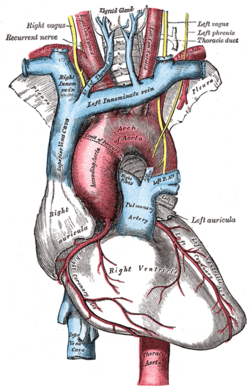 ↑ "The Cardiovascular System (Blood Vessels)". www2.highlands.edu. สืบค้นเมื่อ 2017-04-22. ↑ webmaster@studentconsult.com. "Printed from STUDENT CONSULT: Berne and Levy Physiology 6E - The Online Medical Library for Students plus USMLE Steps 123 (ver. 2.9)". users.atw.hu. สืบค้นเมื่อ 2017-04-22. ↑ 3.0 3.1 3.2 Kulkarni, Neeta V. (2006). Clinical anatomy for students : problem solving approach. New Delhi: Jaypee Bros. Medical Publishers. p. 211. ISBN 978-8180617348. ↑ Singh, Inderbir (2011). Textbook of anatomy (5th ed.). New Delhi: Jaypee Brothers Medical Publishers. p. 465. ISBN 978-9350253823. ↑ Acad Radiol. 2008 Jul;15(7):827-34 doi:10.1016/j.acra.2008.02.001. PubMed. แม่แบบ:PMC. ↑ Bamforth, Simon D.; Chaudhry, Bill; Bennett, Michael; Wilson, Robert; Mohun, Timothy J.; Van Mierop, Lodewyk H.S. ; Henderson, Deborah J.; Anderson, Robert H. (2013-03-01). "Clarification of the identity of the mammalian fifth pharyngeal arch artery". Clinical Anatomy (in อังกฤษ). 26 (2): 173–182. doi:10.1002/ca.22101. ISSN 1098-2353. PMID 22623372. ↑ 9.0 9.1 Rubin, Raphael; Strayer, David S., eds. (2008). Rubin's Pathology: clinicopathologic foundations of medicine (5th ed.). Philadelphia [u.a. ]: Wolters Kluwer/Lippincott Williams & Wilkins. p. 442. ISBN 978-0-7817-9516-6. ↑ David P. Naidich; W. Richard Webb; Nester L. Muller; Ioannis Vlahos; Glenn A. Krinsky, eds. (2007). Computed tomography and magnetic resonance of the thorax (4th ed.). Philadelphia: Wolters Kluwer/Lippincott Williams & Wilkins. p. 100. ISBN 978-0-7817-5765-2. ↑ 11.0 11.1 Spacek, Miloslav; Veselka, Josef (2012). "Letters to Editor Bovine arch". Archives of Medical Science. 1 (1): 166–167. doi:10.5114/aoms.2012.27297. ISSN 1734-1922. PMC 3309453. PMID 22457691. ↑ wrongdiagnosis.com > Aortic knob Citing: Stedman's Medical Spellchecker, 2006 Lippincott Williams & Wilkins. หน้านี้แก้ไขล่าสุดเมื่อวันที่ 5 กุมภาพันธ์ 2562 เวลา 19:09 น.